'Ever Red' laceleaf Japanese maple lights up the edge of an 8- by20-foot pond. 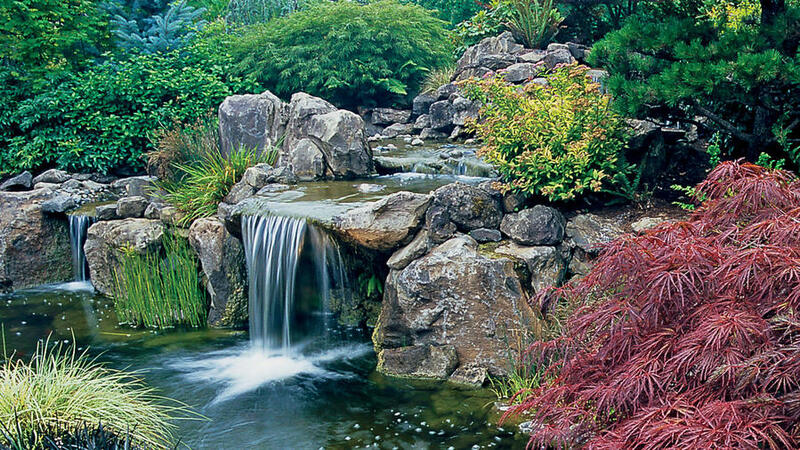 A lush front garden with a splashing waterfall says “welcome home” like nothing else. That’s why Craig and Carrie Prunty placed this mini oasis along a bend in the driveway at their home in Beaverton, Oregon; it’s the first thing to greet them at day’s end. Built on the edge of the property line, a concrete block wall supports the elevated waterfall formed from earth dug out of what became a 4-foot-deep koi pond. Huge boulders were artfully arranged to create the naturalistic scene. A blend of Craig’s favorite trees, shrubs, and perennials accent the pond. The evergreen backdrop is made up mostly of Colorado blue spruce, shore pine, ‘Vanderwolf’ pine, Viburnum davidii, and weeping blue Atlas cedar. Low red and green laceleaf maples and a tall ‘Bloodgood’ Japanese maple at rear add contrast and seasonal color. Carex morrowii expallida, ferns, heathers, and black mondo grass ( Ophiopogon planiscapus ‘Nigrescens’) soften the edges. To keep the koi safe from marauding raccoons and great blue herons, the pond has steep sides and hiding places for the fish.